I checked this book out of the public library. The Great Depression is not a topic children frequently ask about, yet I believe this will change after reading Winter 's loving tribute to his father who grew up in East Texas during the Great Depression. “In that tiny white frame house/there were ten of you – /eight kids/ and your parents – in four small rooms./You slept at the foot of one bed/because there were only two beds/ and you were the youngest." The narrative reads like a conversation the author is having with his father. "You got your water from a well/because there was no indoor plumbing./There were no toilets,/so you had to use an outhouse./I know, because you've told me, Dad./This was the world you grew up in." The marriage of text and illustrations makes this tender book endearing. Using drawing pencils, ink, and watercolor on watercolor paper, Root captures this busy family as they go about their lives. Most of the double-page spreads show Winter’s father doing his chores, smushed at the foot of the bed with his 7 siblings, or riding with his father to pick up a block of ice in their "old Model T." Readers can see that everyone went without most of the basic comforts we take for granted because they were too expensive or unavailable. Yet, not having enough money for shoes did not impede on Winter's father's ability to have fun. Root shows us the young boy enjoying his freedom by walking on the railroad tracks. Never sentimental or gloomy, we learn that people needed to be tough and resourceful. They read by kerosene lantern because they couldn’t afford electricity. Granny Winter had to work hard to keep everyone fed. “The way you describe her, Granny Winter/did everything – cooking, cleaning,/gardening, milking." The family photos of Winter's grandparents and father on the end pages adds authenticity. There is no author's note. 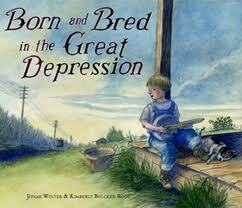 For children of today the Great Depression, 1929-1939, happened a very long time ago. They probably have no living relative who experienced those hardships. Fortunately, we can hand them this touching, nonfiction picture book that will gently introduce the subject without being overwhelming. Great post!!! In really had a great time reading it!!! It was really informative, thanks for sharing!